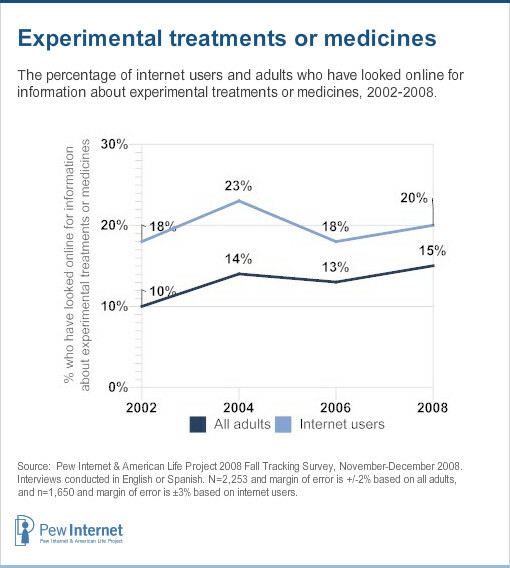 20% of internet users look online for information about experimental treatments or medicines. The percentage of internet users who look online for information about experimental treatments or medicines has remained relatively steady over the past six years. About one-fifth (20%) of internet users currently research experimental treatments online, up just two percentage points, from 18%, since 2002 – a statistically insignificant change. 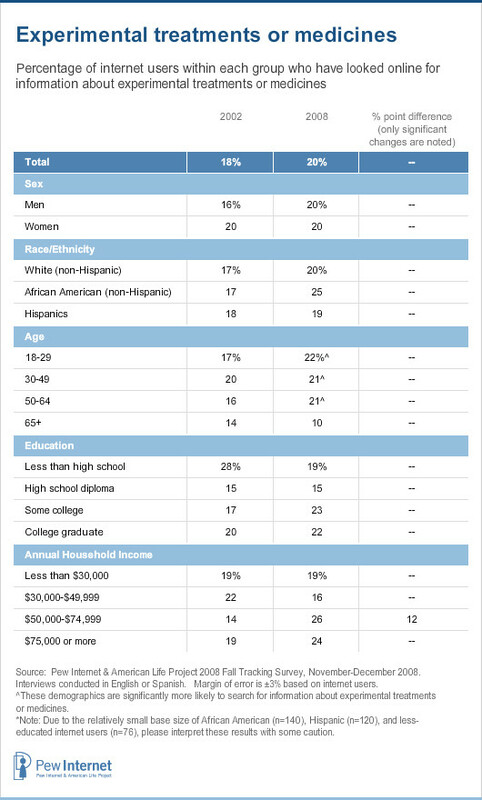 Nearly all demographic groups are about equally likely to look for experimental treatment information online. In a trend similar to that in alternative treatments, internet users age 65 and older are significantly less likely than younger internet users to research experimental treatments online. Just one in ten (10%) wired seniors look online for information about experimental treatments, while roughly 21% of younger internet users do so. The only demographic group that showed a significant increase in the percentage looking online for information about experimental treatment were those in households making $50,000-$74,999. In 2002, 14% of this mid-upper income group looked into experimental treatments online, and in 2008 over a quarter (26%) did so. Adults seeking experimental treatment information are much more likely to also look for information about both prescription or over-the-counter drug and alternative treatments or medicines. Nearly two-thirds (63%) of adults who looked for information about experimental treatments at some point also researched other forms of treatment online, including drugs and alternative medicines. 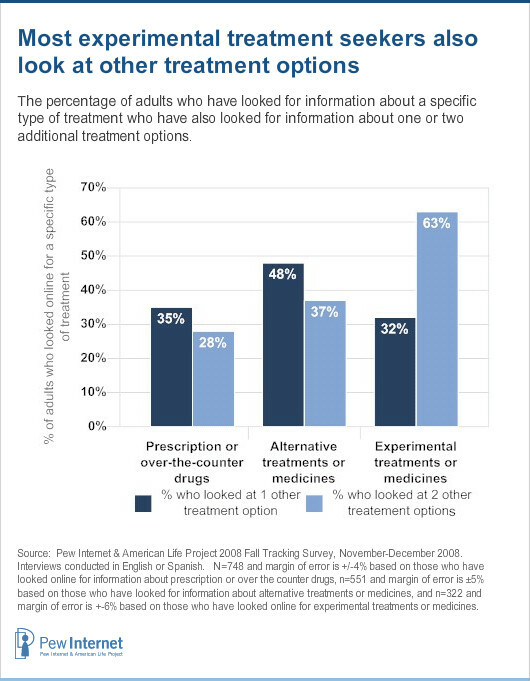 Only 5% of adults who sought information about experimental treatment looked exclusively for information on treatment of that sort. In all, 95% weighed at least one other method of treatment. Those looking for drug and alternative treatment information online were much less likely than adults looking for experimental treatment to also look at the other two options. Some 85% of alternative treatment information seekers looked for information about at least one other treatment method, while 63% of drug information seekers did so.